Vancouver – November 2, 2017 – UFCW Canada activists recently participated in the Canadian Professional Association for Transgender Health’s Biennial Conference and Annual General Meeting, held in Vancouver from October 26 to 29. Calgary – September 8, 2017 – Keeping a wonderful tradition alive, UFCW Canada activists were loud and proud at the 27th Annual Calgary Pride Parade on September 3. Montreal – August 22, 2017 – UFCW Canada Local Unions from across the country were out in full force this past weekend, showing their solidarity and pride at the first-ever Canada Pride celebration held during Montreal's annual Pride festival – one of the largest LGBTQI2S gatherings in the country. Vancouver and Charlottetown, P.E.I. 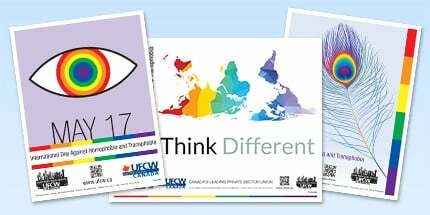 – August 10, 2017 – UFCW Canada activists from across British Columbia and Prince Edward Island recently celebrated equality, diversity, and inclusion at Pride events in each province. London, Ont. – August 4, 2017 – UFCW Canada Local 1006A members and allies from across Southwestern Ontario were out in full force on July 30 to participate in London’s Pride parade. Halifax – July 26, 2017 – UFCW Canada activists recently joined the LGBTQI2S community in Halifax, Nova Scotia to celebrate diversity and equality at the Halifax Pride Parade on July 22.